This is a 10-pin socket with 2mm pitch that mates with the popular XBee radio from Digi. Use this small part to avoid having to solder your precious radio to a PCB. You'll need two of these sockets to connect to all 20 pins on the XBee. **Please Note: **This item is sold singly, not in pairs. Be careful soldering in the stand offs! Don't let too much solder run down into the holes. I soldered in the 2mm sockets normally, and some of the solder ran through and into the holes that accept the xbee's pins. I could not get the solder out with wick, so the socket (and the board when i tried to desolder it) was ruined. you can see where some of the solder went through and filled the copper receptacles, so the xbee would not plug in. This happened to me too. Got it on the second attempt by using parchment paper. I cut a piece of parchment paper large enough to cover the pins on the connector with a little extra to grab after soldering. Next I put the parchment paper on a piece of foam and then punched the pins on the connector through the paper. Now with the paper on the pins I put the connector on my board so the paper was between the board and the connector and soldered it in place. The parchment paper prevented the solder from running into the connector. After I finished soldering I gently pulled the parchment paper cutting it on the pins to remove it. Brilliant advice with the parchment paper. Worked great! Moral: Buy one or two extra sockets. I can confirm it is unusually difficult to solder these sockets onto the XBee BOB. 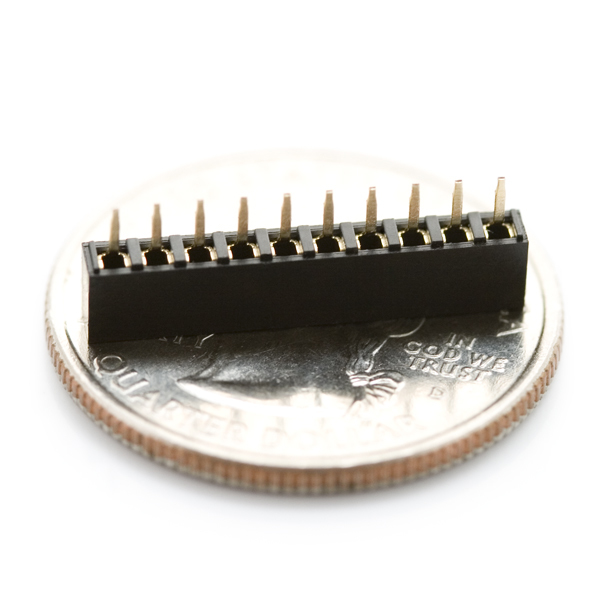 Compared to the 0.1" female headers SFE sells, these sockets are about half the depth, and the pins are thinner also, so there is more room for the solder to flow down into the socket. All you have to do is screw up one of the 20 solder joints to make it impossible to reliably seat the XBee module. Definitely buy several extra sets of these and be prepared for some trial and error. I see lots of comments about difficulty soldering these and the poor quality, but most of the comments are dated. Have these issues been addressed? Or is there a better quality (more expensive) part available elsewhere? Trying to use these on my XTend radios was problematic - impossible to install on the XTend header without forcing the pins to spread. Not about to do that to these radios. Instead, I opted for Mouser p/n 649-63453-120LF. Warning: These headers are very susceptible to damage. Do not put any wires into these headers for debugging purposes just the XBee modules. After a few weeks of debugging I have destroyed all of the headers I was working with meaning I now need to replace them. Basically it seems like the socket spreads out and the connection becomes very lose and basically worthless. Digikey part number is S5751-10-ND. May be less expensive if you need a lot. Otherwise Sparkfun is the place to order for small quantities. Does Sparkfun have the SMD version of this available for purchase? We're not selling them at the moment (if enough people want them we'll consider it), but you can find them at DigiKey: S5902-10-ND. 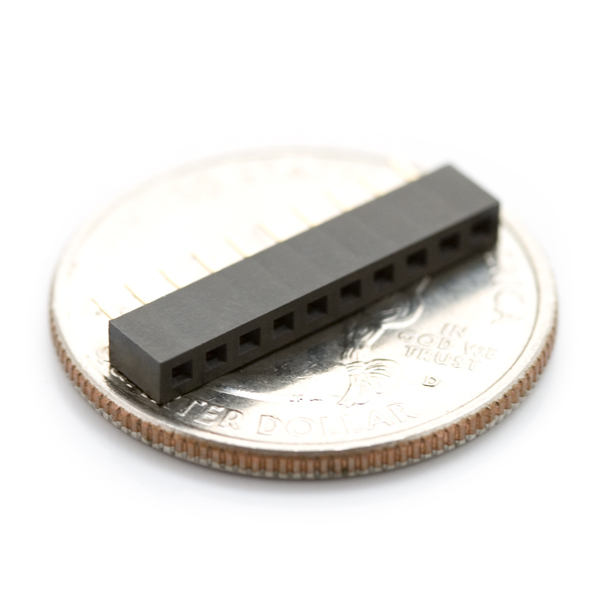 Here's the Digi-Key part number: 2563S-10-ND. So much more expensive! I know its tough always being #2 Xbee Socket. But with a positive attitude, hard work, and some crafty salesmanship one day you will be #1. I wish I knew about the soldering issues with these! Just ruined a board since it's pretty much impossible to fix these with soldering wick (though if I had a heat gun it might allow extracting the part from the board). Thankfully I had extras...but let this serve as a warning to others! I couldn't find this socket in the SFE library. Has it been removed? So, after you solder in the socket and connect up the XBee module, measure the VCC and GND pins on the module (not on the socket pins) to make sure you get the 3.3 volts. You can use solder wick to keep solder from dripping into the socket. Be careful! These are poorly designed! These sockets seem to be identical to the Digi-recommended Samtek sockets that cost 4 times as much at D***Key. So only $1 per socket is a bargain compared to $4 each. Too much solder is always a problem with stamped-pin sockets. They need a solder barrier or use sockets with machined pins. I definitely second what bearsinthesea said, the same thing happened to me. BE CAREFUL SOLDERING THESE! If you feed enough solder in to get the nice conical shape you normally have on a good connection, you will have most certainly used WAY to much and filled the sockets with solder. If it happens to you, you can yank hard enough on the plastic shell and it will separate from the pins. You can then easily desolder each pin. Your board will be fine, but the connector will obviously be ruined. Even if I had read all those negative comments from years ago, I would have assumed by now that a great distributor like SparkFun would have fixed the problem of solder leaking into the sockets and ruining them. I won't make that mistake again; unless SparkFun staff respond to negative comments, I will assume the issue is still unresolved. Nobody wants to melt solder onto a $25+ Xbee, do they? These work well. The pins are a nice length and barely stick out the other side of your PCB. Note the pins are not "normal" breadboard spacing. You will need SparkFun's Xbee breakout and two of these headers, if you want to make an Xbee standoff adapter for a breadboard.